April 25-June 3, Wed. 1:30 & 7 p.m., Thu. 7 p.m., Fri-Sat. 8 p.m., Sun. 1 & 5:30 p.m. The enchanting tale of a Dublin street musician who’s about to give up on his dream when a beautiful young woman takes an interest in his haunting love songs. Paramount Theatre, 23 E. Galena Blvd., Aurora, (630) 896-6666, paramountaurora.com. April 27, 7:30 p.m. The Neverly Brothers pay tribute to the music pioneers of the 1950s and the 1960s British invasion bands, featuring hits of Jerry Lee Lewis, Chuck Berry, Buddy Holly, The Beatles, The Rolling Stones, The Kinks and The Dave Clark Five. Metropolis Performing Arts Center, 111 W. Campbell St., Arlington Heights, (847) 577-2121, metropolisarts.com. April 27, 8 p.m. Marshall Charloff’s tribute to Prince. 105 E. Main St., Arcada, St. Charles, (630) 587-8400, arcadalive.com. American English: Beatles No. 1s! April 28, 7 p.m. Celebrate the Beatles’ No. 1 hits: “Please Me,” “Love Me Do,” “A Hard Day’s Night” and 24 more. Blizzard Theatre, Elgin Community College Arts Center, 1700 Spartan Dr., Elgin, (847) 622-0300, elgin.edu. April 28, 7:30 p.m. The band delivers a true Eagles concert experience from “Hotel California” to “Peaceful Easy Feeling.” Woodstock Opera House, 121 Van Buren St., Woodstock, (815) 338-5300, woodstockoperahouse.com. April 28, 8 p.m. The trio’s original compositions blend elements of jazz, rock, classical and Mexican folk to deliver a message of love, brotherhood and social justice. Fermilab, Ramsey Auditorium, Kirk Road & Pine Street, Batavia, (630) 840-2787, fnal.gov/culture. May 3-5, Thurs.-Fri. 6 p.m., Sat. 1 p.m. A comedic twist on the legend of Robin Hood and his Merry Men as they fight against the corrupt Sheriff of Nottingham. For children grades 1-6. Metropolis, Arlington Heights, (847) 577-2121, metropolisarts.com. May 4-20, Fri.-Sat. 8 p.m.; May 13 & 20, 3 p.m. For empty-nester Greg, meeting Sylvia is love at first sight; when he brings home the stray, exuberant lab-poodle mix, his wife Kate is less than thrilled. A smart, occasionally salty comedy about relationships, nature and growing older. Williams Street Rep, Raue Center for the Arts, 26 N. Williams St., Crystal Lake, (815) 356-9212, rauecenter.org. May 4, June 1, 8-10:15 p.m. An evening of improvisation à la “Whose Line is it Anyway?” Fun for all ages, competing teams of improvisors, live music and a cash bar. Green Room Productions, Hemmens Cultural Center, 45 Symphony Way, Elgin, (847) 931-5900, hemmens.org. May 4, 5-8 p.m. This month’s art show features the work of students from District 47 schools. Lakeside Arts Park, 401 Country Club Road, Crystal Lake, (815) 455-8000, lakesideartspark.org. May 5, 7:30 p.m. Guitar virtuoso Haque performs with his jazz quartet along with contemporary composer Franz Casseus on classical guitar, bass and percussion. Norris Cultural Arts Center, 1040 Dunham Road, St. Charles, (630) 584-7200, norrisculturalarts.com. May 5-6, 10 a.m.-5 p.m. More than 130 Midwest artisans selling one-of-a-kind art; kid’s court, food vendors, gourmet food gifts and entertainment. Elmhurst Park District, Wilder Park, 175 S. Prospect Ave., (630) 993-8900, epd.org. May 5-6, Sat. 7:30 p.m., Sun. 2:30 p.m. The ESO’s premiere of Leonard Bernstein’s “Candide” Suite, to celebrate the 100th anniversary of the composer’s birth; the program also features Mahler’s “Symphony No. 5,” including “Adagietto,” perhaps the most famous of all his works. Hemmens, Elgin. Tickets: ESO, (847) 888-4000, elginsymphony.org. May 6, 7-9 p.m. A national guitar competition winner, Gruca plays selections from his wide repertoire of Renaissance, Baroque, Romantic and 20th century music. Barrington’s White House, Barrington, (224) 512-4115, barringtonwhitehouse.com. May 6, 7:30 p.m. The ECC Steel Bands entertain with an eclectic mix of calypso, reggae and rock. Blizzard Theatre, ECC Arts Center, Elgin, (847) 622-0300, elgin.edu. May 7, 7 p.m. Chicago’s legendary sketch and improv comedy theater features pieces and characters made famous by alumni like Tina Fey, Stephen Colbert and Bill Murray. Blizzard Theatre, ECC Arts Center, Elgin, (847) 622-0300, elgin.edu. May 7, June 18, July 30, 7 p.m. Showcasing new scripts and emerging playwrights who read their work; followed by audience discussion. Raue Center, Crystal Lake, (815) 356-9212, rauecenter.org. May 12, 7:30 p.m. A celebration of the Beach Boys’ signature hits such as “Surfin’ USA,” “Help Me Rhonda,” and “Good Vibrations.” Metropolis, Arlington Heights, (847) 577-2121, metropolisarts.com. May 12, 8 p.m. The 7-piece band performs a potpourri of American music, ragtime, blues, jazz and pop. Woodstock Opera House, (815) 338-5300, woodstockoperahouse.com. May 12, 8 p.m. Award-winning comedienne Rudner entertains with hilarious observations about relationships. Raue Center, Crystal Lake, (815) 356-9212, rauecenter.org. May 13, 5 p.m. Pleasing crowds since the early 1960s, Noone has reformed a band to perform the group’s repertoire. Arcada, St. Charles, (630) 587-8400, arcadalive.com. May 17-June 30, Thu.-Sat. 7:30 p.m., Sat.-Sun. 3 p.m. The Broadway Tony winner for Best Musical, Best Score and Best Book features a cast of people and puppets who tell about surviving in NYC with big dreams and a tiny bank account in a risqué and entertaining way. Adult subject matter; parental discretion advised. Metropolis, Arlington Heights, (847) 577-2121, metropolisarts.com. May 17, 8 p.m. Unwind with an evening of rehearsed sketch and spontaneous comedy in the café. Raue Center, 26 N. Williams St., Crystal Lake, (815) 356-9212, rauecenter.org. May 18, 1:15 p.m. Lakeside resident artist Grochowski combines guitar and vocals in this afternoon performance. The Listening Room, Lakeside Arts Park, Crystal Lake, (815) 455-8000, lakesideartspark.org. May 18-19, 8 p.m. The legendary acoustic guitarist, known for his innovative finger-picking style, draws on influences from blues, jazz and folk. Woodstock Opera House, (815) 338-5300, woodstockoperahouse.com. May 18-June 10, Fri.-Sat. 8 p.m., Sun. 3 p.m. After suffering a major loss while on a cross-country bike trip, 21-year-old Leo seeks solace from his feisty 91-year-old grandmother, Vera, in her West Village, NYC apartment. Over the course of a single month, these unlikely roommates infuriate, bewilder and ultimately reach each other. Steel Beam Theatre, St. Charles, (630) 587-8521, steelbeamtheatre.com. May 24, 7:30 p.m. The all-female tribute band from San Francisco celebrates their passion for Zeppelin music. Arcada, St. Charles, (630) 587-8400, arcadalive.com. May 25, 6 p.m. In “A Star is Dead,” major stars are vying for the role of a lifetime in a big Hollywood movie. As the auditions take a dark turn, the audience helps solve this 1930s whodunnit. Metropolis, Arlington Heights, (847) 577-2121, metropolisarts.com. May 25, 6-9 p.m. Held monthly, this regional art event features a juried art exhibit and photo contest, a solo exhibit, vendor artists, live music and a cash bar. Starline Factory, 300 W. Front St., Harvard, (815) 347-8535, starlinefactory.com. May 26, 8 p.m. Rock with music from the ’80s, including Journey, REO Speedwagon, Bon Jovi and Boston. Pheasant Run Resort & Spa, 4051 E. Main St., St. Charles, (630) 584-6342, pheasantrun.com. May 29, 7:30 p.m. The Grand Moravia Jazz Trio plays a program dedicated to the 100-year anniversary of the founding of Czechoslovakia, featuring Czech, Moravian and Slovak folk music inspirations. Metropolis, Arlington Heights, (847) 577-2121, metropolisarts.com. June 1, 5-8 p.m. This month’s art show features the work of William Stone and photographer Felissa Onixt. Lakeside Legacy Arts Park, Crystal Lake, (815) 455-8000, lakesideartspark.org. June 3, 7:30 p.m. Suzanne O. Davis brings Carole King’s Tapestry album to life, with hits like “It’s Too Late,” “So Far Away” and “Will You Still Love Me Tomorrow?” Arcada, St. Charles, (630) 587-8400, arcadalive.com. June 7-17, Thu.-Sat. 7:30 p.m., Sun. 2 p.m. A madcap comedy about the trouble that ensues when a famous opera singer is presumed dead and a substitute takes his place. Stage Coach Players Theatre, 126 S. 5th St., DeKalb, (815) 758-1940, stagecoachers.com. June 9, 7 p.m. The Judith Svalander Dance Theatre returns to perform contemporary and classical ballet. Woodstock Opera House, (815) 338-5300, woodstockoperahouse.com. June 9, 8 p.m. Known for her soothing, sultry voice and passion for jazz, Krall shares original music and puts a spin on old classics like “The Look of Love,” and “A Case of You.” Paramount, Aurora, (630) 896-6666, paramountaurora.com. June 10, 3 p.m. 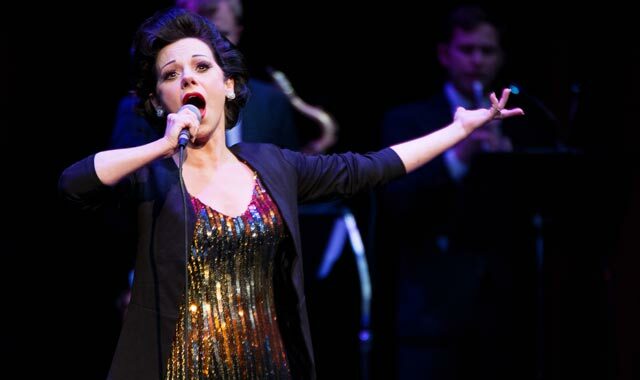 In “Come Rain or Come Shine,” Angela Ingersoll captures the emotional and vocal power of Judy Garland with iconic songs such as “Over the Rainbow,” “Get Happy” and “The Man That Got Away.” Paramount, Aurora, (630) 896-6666, paramountaurora.com. June 15-16, check website for times. Fresh faces and familiar favorites, including Elle King, Aaron Neville and Sonny Landreth, rock the banks of the Fox River. RiverEdge Park, 360 N. Broadway, Aurora, (630) 896-6666, riveredgeaurora.com. June 15, 1:15 p.m. One of Chicago’s premiere violinists, Kawalkowski dazzles with performances on violin and piano. The Listening Room, Lakeside Arts Park, Crystal Lake, (815) 455-8000, lakesideartspark.org. June 15, 8 p.m. Bee Gees tribute band re-creates disco fever with hits like “Night Fever” and “Jive Talkin.” Paramount, Aurora, (630) 896-6666, paramountaurora.com. June 15-16, Fri. 8 p.m., Sat. 3 & 8 p.m. Charles Ross entertains with his irreverent parody and homage in “One Man Dark Knight,” covering Batman’s origins to his epic battles against Gotham’s supervillains. Raue Center, Crystal Lake, (815) 356-9212, rauecenter.org. June 15-24, Fri.-Sat. 8 p.m., Sun. 2 p.m. A surprise visit from actress Masha and her 20-something boy toy, Spike, throws the normally quiet childhood home of sisters Vanya and Sonia into upheaval. TownSquare Players, Woodstock Opera House, (815) 338-5300, townsquareplayers.org. June 16, 3 p.m. In this whirlwind solo show, Charles Ross retells the classic trilogy in 60 minutes, including all the characters, music, ships and battles. Raue Center for the Arts, Crystal Lake, (815) 356-9212, rauecenter.org. June 16, 8 p.m. Journey through the trilogy in one hour as Charles Ross re-creates the world of Middle-earth. Raue Center, Crystal Lake, (815) 356-9212, rauecenter.org. June 21, 8 p.m. Unwind with an evening of rehearsed sketch and spontaneous comedy in the café. Raue Center, Crystal Lake, (815) 356-9212, rauecenter.org. June 22, 6-9 p.m. Held monthly except Nov. and Dec., this regional art event features a juried art exhibit and photo contest, a solo exhibit, vendor artists, live music and a cash bar. Starline Factory, Harvard, (815) 347-8535, starlinefactory.com. June 22, 7:30 p.m. The multimedia production includes Abba’s big hits such as “Waterloo,” “Dancing Queen” and “Mama Mia.” Arcada, St. Charles, (630) 587-8400, arcadalive.com. June 22-July 1, Fri.-Sat. 7:30 p.m., Sun. 2 p.m. Children’s Theatre of Elgin and Fox Valley Theatre Company celebrate 30 years of family-oriented musical theatre with a dynamic song-and-dance revue. Blizzard Theatre, ECC Arts Center, Elgin, (847) 622-0300, elgin.edu. June 24, 4 p.m. Relax to music by the Lake Geneva Symphony Orchestra, performing songs from films such as “Lord of the Rings,” “Frozen,” “Star Wars” and “Pirates of the Caribbean.” Ferro Pavilion, George Williams College of Aurora University (GWC), 350 Constance Blvd., Williams Bay, Wis., (262) 245-8501, musicbythelake.com. July 6-Aug. 12, Fri.-Sat. 8 p.m., Sun. 3 p.m. Johnny Cash’s life story is told through a unique musical about love and faith, struggle and success, rowdiness and redemption, and home and family. Raue Center, Crystal Lake, (815) 356-9212, rauecenter.org. July 7, 7 p.m. Sit back and relax to the rich voice of David Robbins as he performs the smooth tunes made famous by Johnny Mathis. Pheasant Run, St. Charles, (630) 584-6342, pheasantrun.com. July 7, 7:30 p.m. Accompanied by The Noisemakers band, pianist and singer/songwriter Hornsby taps into many musical genres such as pop, jazz, bluegrass and soul. Ferro Pavilion, GWC, Williams Bay, Wis., (262) 245-8501, musicbythelake.com. July 12, 7:30 p.m. The longest established group paying tribute to Queen and Freddie Mercury. Arcada, St. Charles, (630) 587-8400, arcadalive.com. July 12-22, Thu.-Sat. 7:30 p.m., Sun. 2 p.m. Blushing brides, nervous grooms, overbearing moms, and unexpected guests make an unforgettable wedding day. Stage Coach Players, First Lutheran Church of DeKalb, 324 N. 3rd St., DeKalb, (815) 758-1940, stagecoachers.com. July 12-Aug. 25, Thu.-Sat., 7:30 p.m., Sat.-Sun. 3 p.m. Rock to the songs of legendary performers of the 1960s, such as Aretha Franklin, Tina Turner and Connie Francis. Metropolis, Arlington Heights, (847) 577-2121, metropolisarts.com. July 13-15, Fri. 8 p.m., Sat. 2 & 8 p.m., Sun. 2 p.m. Fast-talking Harold Hill causes quite a stir in River City, Iowa, when he comes to town promising to organize a boys’ band. Will Marian, the librarian, bring him back from the brink of his con? Pheasant Run, St. Charles, (630) 584-6342, pheasantrun.com. July 14, 7:30 p.m. One of the biggest names in country music, Wynonna Judd, performs with her band, led by husband/drummer/producer Cactus Moser. Ferro Pavilion, GWC, Williams Bay, (262) 245-8501, musicbythelake.com. July 14, 8 p.m. Award-winning composer Siegel brings blues, folk and classical fans together for an original genre of music. Woodstock Opera House, (815) 338-5300, woodstockoperahouse.com. July 21, 7:30 p.m. Grammy Award-winning baritone Gunn and the Chicago Philharmonic entertains with an evening of love songs. Ferro Pavilion, GWC, Williams Bay, Wis., (262) 245-8501, musicbythelake.com. This entry was posted on Tuesday, May 1st, 2018 at 12:00 pm	and is filed under Arts & Entertainment. You can follow any responses to this entry through the RSS 2.0 feed. Both comments and pings are currently closed.